The art show is sold out. The Norwescon art show staff are thrilled to present John Jude Palencar as Norwescon 33’s Artist Guest of Honor. His award winning work will be the highlighted feature of this year’s Art Show. Along with our many great artists that we have had in the past, we are excitedly looking for new faces to bring to the show. Please use the Online Art Show tool to log into the Online Art Show. You can update your profile information and add and edit your art and print out your bid tags within this online tool. All of the information you need to sign up for the Art Show is now available for download. If you have any questions always feel free to contact us directly. You can reach us at artshow at Norwescon dot org. The art show is looking for more great volunteers. Become part of the team who make the art show fun and successful. 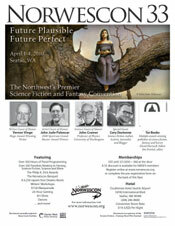 If you are interested in joining us please contact our volunteer department at volunteers at Norwescon dot org. We would love to hear from you.